Two-inch electrically-powered, submersible trash pump can move 79 gallons per minute and handle solids up to 5/8 inch weighing in at 33 pounds. PUMPING POWER: Efficient ½ HP Motor – Can pump up to 79 Gallons Per Minute or 4760 Gallons Per Hour for quick and easy dewatering. DURABLE DESIGN: The SP20ET is made with heavy duty cast iron design to handle heavy usage & tough Construction site applications. LIGHTWEIGHT: Easy to transport - weighs only 33 pounds. WATER DISCHARGE CAPABILITY: 2 in. Port Side discharge – allows for dewatering surfaces up to 2 in. 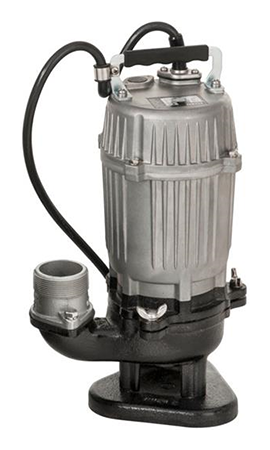 SOLIDS HANDLING: Trash pump model (SP20ET) can handle solids up to 5/8 in. including leaves and sewage. EASY CLEANOUT: Cleanout is fast and easy by means of three butterfly bolts.